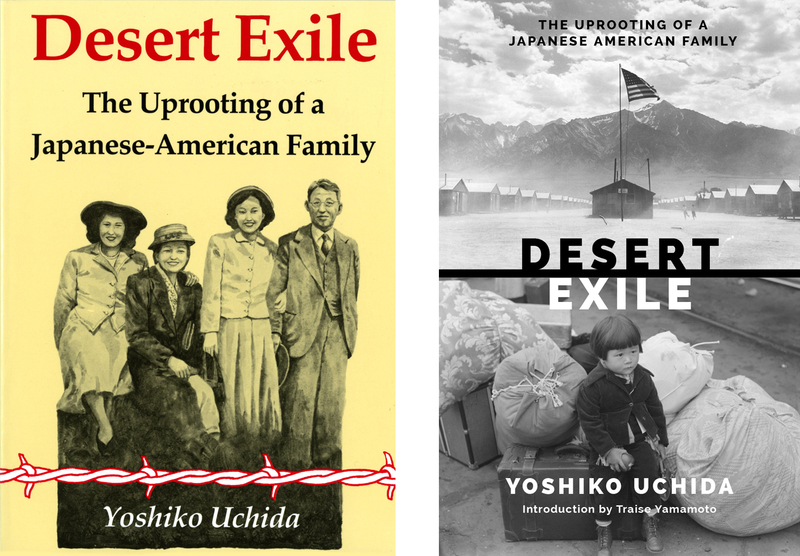 For our Throwback Thursday contribution to the University Press Week blog tour, we’re taking a look at how cover designs for our Classics of Asian American Literature series have evolved over time. Below, we feature the original book covers alongside their new designs and comments from University of Washington Press designers Thomas Eykemans and Dustin Kilgore. Their comments illuminate some of the challenges and opportunities that arise in reimagining book covers to better fit contemporary trends while also highlighting the historic significance of the books and their authors. The cover of the 1973 edition (left) and the 2014 edition (right). Design statement: Prior to the 2014 reissue, the most recent edition of America Is in the Heart was published by the University of Washington Press in 1973 and featured a 1946 illustration by Frances O’Brien from the cover of the Saturday Review of Literature. When the design was reduced in size for the 1973 book cover, the shadows on Bulosan’s face appeared heavier than in the original illustration. The determined look in Bulosan’s eyes in the original O’Brien illustration became almost glowering as the quality of the illustration was degraded over time. 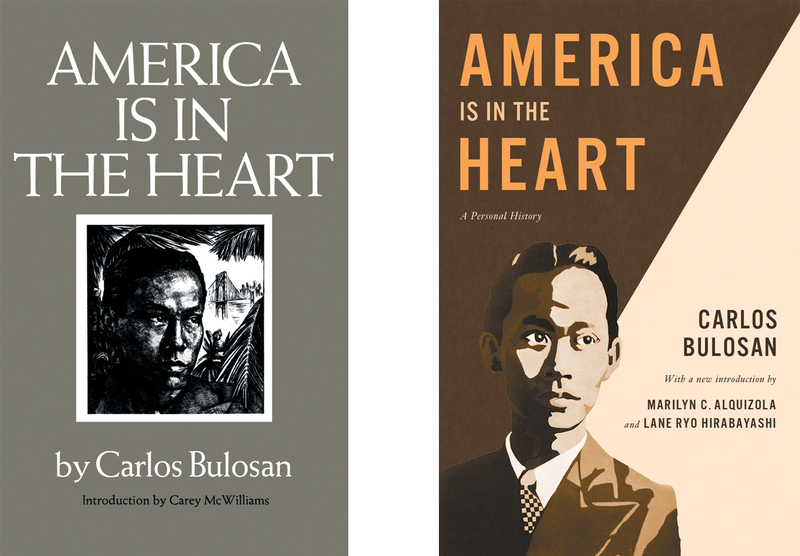 For the new cover, we wanted a more upbeat tone that highlighted Bulosan’s unerring hope for America even in the face of hardship. Urban Artworks—a local organization that uses public art to empower youth—had recently installed a Carlos Bulosan mural in Seattle’s International District. That image showed more optimism and nuance, so it fit perfectly with the direction I was hoping to take the new cover design. I switched the image’s color palette to warmer tones, rather than staying with the cool color palette the mural uses. The cool tones work well for the place the mural is installed, but I was concerned it would make the book less inviting and unintentionally repeat the somewhat sinister effect of the shadows we saw in the reprints of the 1973 edition. Read more about the new America Is in the Heart cover design here. The cover of the 1983 edition (left) and the 2014 edition (right). Design statement: The original 1946 jacket, lettered and illustrated by Okubo herself, was both classic and practical. However, it gave absolutely no clue as to the content of the book. The 1983 paperback did little to remedy this, simply appropriating the beautiful, but misleading, case stamp from the original cloth edition. The two new editions feature details of actual illustrations from the interior, while preserving the unique and memorable deco typography of the earlier title design. 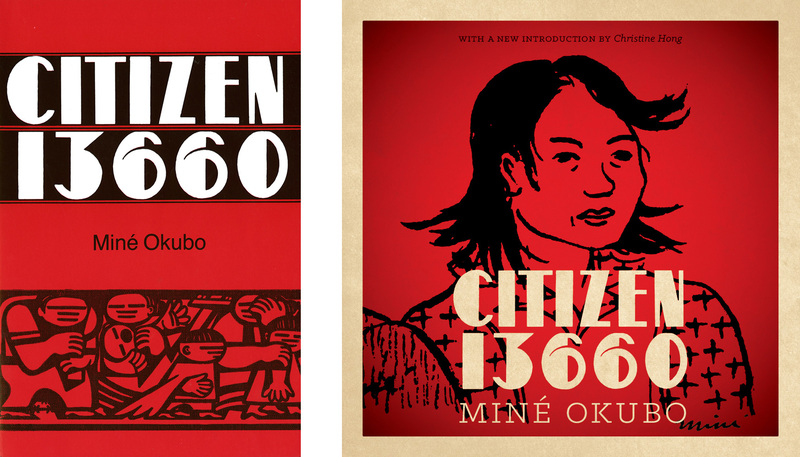 Read more about the new Citizen 13660 cover design here. The cover of the 1979 edition (left) and the 2014 edition (right). 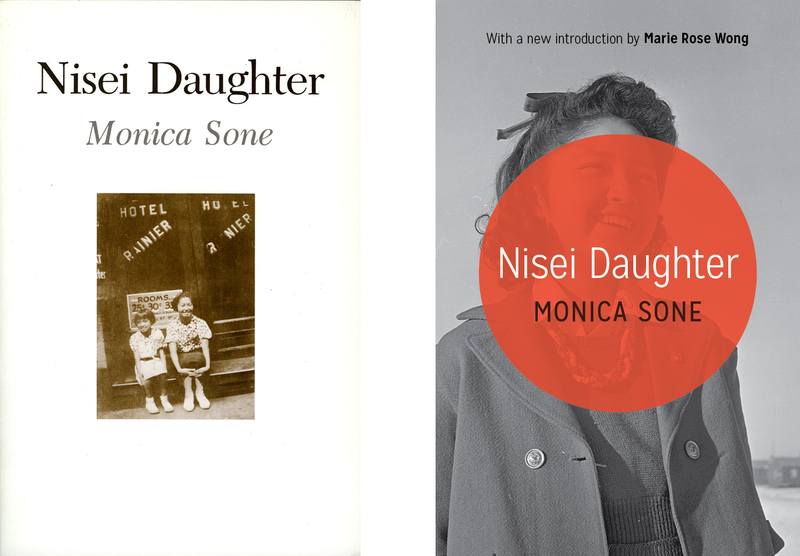 Design statement: Nisei Daughter is a memoir about the author’s experience as a young Japanese American woman incarcerated in World War II era concentration camps. She uses a surprising range of humor and levity in her reflections on this traumatic period in her life, but the 1979 edition of the book featured a minimalist design that didn’t capture the book’s nuanced tone. The historic photo on the cover of the 2014 edition shows a youthful Nisei woman with a smile on her face despite the unjust and harsh circumstances of her incarceration. The red circle is a reference to the Japanese flag but when overlaid on the girl’s face it portrays the reduction of people’s identities when placed into camps. The cover of the 1978 edition (left) and the 2014 edition (right). Design statement: After reading No-No Boy and learning about its historical context, I did extensive research into past iterations of the book, including a dramatization. It seemed clear that, as historical fiction, an illustration would be the most appropriate approach. We reached out to Jillian Tamaki, an award-winning contemporary illustrator who teaches at the School of Visual Arts and recently released her second graphic novel. After several rounds of sketches, we settled on a downcast profile of Ichiro overlaid with a bold title. The typeface is a modified Futura, a geometric sans-serif that was ubiquitous in the 1950s and appropriate to the era. The downward diagonals of the “N” and “Y” letterforms intersect the upward angle of the profile, creating a tense visual “X” that pulls the eye to the center before expanding outward. The soft, cool tones of the illustration contrast the intense warmth of the title while also alluding to the national colors of the U.S. and Japanese flags. These elements combine to evoke the deeply conflicted character of Ichiro and his struggles to find his place. 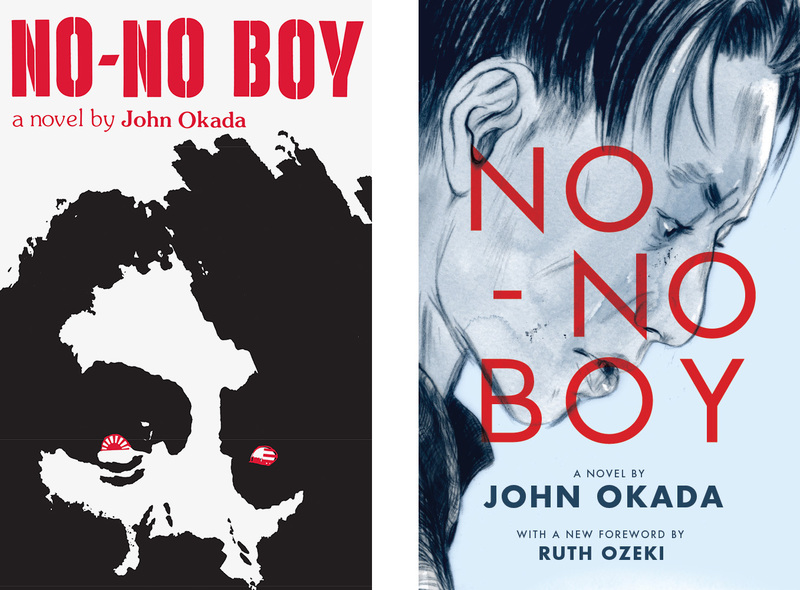 Read more about the new No-No Boy cover design here. The cover of the 1982 edition (left) and the 2015 edition (right). Design statement: After discussions with assistant editor Tim Zimmermann, who is overseeing the reissues in this series, we decided that using a documentary photo that reflects the mood of Uchida’s writing would be the best approach. The Work Projects Administration commissioned a series of photos of the concentration camps and so we were fortunate to have the work of some of the best photographers of the twentieth century to choose from while doing image research. The top photo was taken at the Manzanar concentration camp by Dorothea Lange. The bottom was taken by Russell Lee and depicts a child in the process of being “evacuated” from Los Angeles in 1942. By dividing the cover with two photos, I wanted to convey separation, division, and exile while suggesting a span of time since the book is a personal history. The cover of the 1985 edition (left) and the 2015 edition (right). 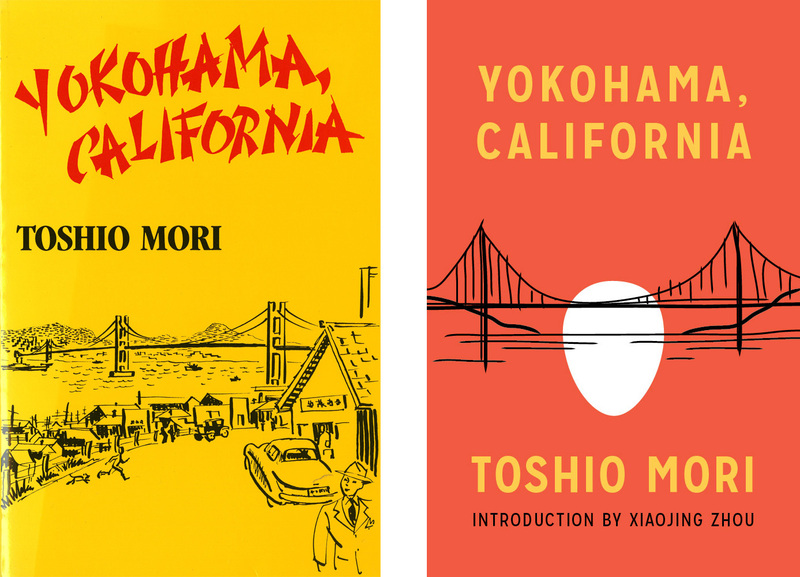 Design statement: Toshio Mori’s collection of interrelated short stories is both familiar and dreamlike. One story, “The Eggs of the World,” inspired this redesigned cover. In the tale, a drunken local explains how an egg is a metaphor for people stuck in their shells. As the stories are set in a fictionalized Oakland, I wanted to find a way to represent a sense of place while imbuing it with a more symbolic meaning. Although I retained the sketchy qualities of the original cover, I applied a more contemporary type treatment because the questionable “chop suey” typography seemed to demean the efforts of the writing. This entry was posted in Behind the Covers, Book Design on November 13, 2014 by uwpressblog.